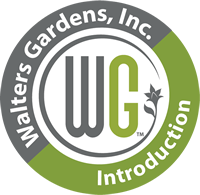 Top New Items for 17-18 | Walters Gardens, Inc.
Best New Perennials of the Season! (Japanese Anemone) This perennial produces dark rose pink flowers above a small mound of green foliage. Each flower is lined with a double row of petals. This Anemone will be one of the final performers in your fall garden. (Japanese Anemone) This perennial produces bright rose pink flowers above a small mound of green foliage. Each flower is lined with a double row of petals. This Anemone will be one of the final performers in your fall garden. (False Indigo) The first bicolor of the series! Soft yellow flowers age to dusty raspberry purple, with both colors appear on the stem at the same time. Charcoal stems really make the colors pop. Forms an incredibly full and bushy habit. (False Indigo) Golden yellow flower spikes rise up above its wide habit. One of the most floriferous Baptisia we offer. Attractive round seed pods in the fall. The perfect specimen for filling large spaces in your garden or for mass plantings. (Elephant Ear, Tropical Temperennial) Tropical plant with huge, dark mahogany leaves. Very full habit. 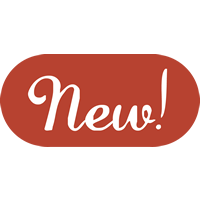 Its clumping nature translates to a large number of new leaves and quickly filling out a container. (Pinks) Fully double, carnation-like flowers. 1.5in wide, deep red flowers have a sharply contrasting, very light pink picotee edge. Flowers appear proportionately above the narrow, blue-green foliage. (Pinks) Double, striking coral pink flowers are produced over a tight, compact mound of blue-green foliage. A quick shearing after flowering will encourage rebloom in early fall. (Pinks) Large, florist quality, fully double, raspberry pink blossoms about 1¾ inches wide. Each serrated petal is framed by a razor thin white edge. A polished, upright habit with blue-green foliage. (Pinks) We've been working hard on breeding Dianthus in the Walters Gardens, Inc. hybridizing department, and we now have a new collection of double flowering cultivars as a result. Double, medium pink flowers with blue-green foliage. Very floriferous and a petite package. (Pinks) We've been working hard on breeding Dianthus in the Walters Gardens, Inc. hybridizing department, and we now have a new collection of double flowering cultivars as a result. Dramatic, rich red flowers that grab you from a distance. Flowers are held on strong stems above blue-green leaves. (Daylily) 4in wide, orange mango petals with a light rose band, pink mid-rib, and green throat. Well-branched, 4-way flower scapes have upwards of 32 buds per scape. Flowers are cookie-cutter consistent in form and color with excellent rebloom. 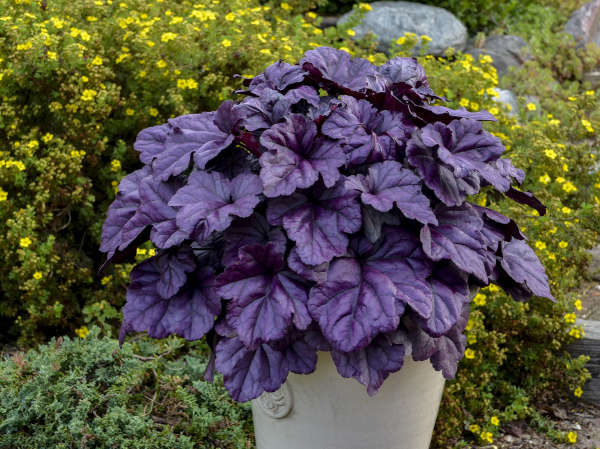 (Coral Bells) A dense habit of large, bright rosy purple leaves with deep charcoal gray veining. The prominent dark veining causes the foliage color pop. Upright, dark burgundy rose flower scapes have matching dark buds that open to rosy pink flowers. (Coral Bells) Incredibly wavy, chartreuse yellow leaves. Perhaps one of our brightest yellow Heucheras. Ruffling becomes less pronounced as the foliage matures. For best yellow color, site in dappled shade or morning sun. Cream flowers appear in early summer. (Foamy Bells) Bubblegum pink flowers appear in spring and bloom without vernalization. In spring, large, dissected leaves emerge amber yellow with deep rose centers that vein out. Leaves mellow to bright chartreuse green with a silver overlay. (Rose Mallow) Very large, 8-9” three-dimensional flowers are white with intense deep pink veining and a notable large red eye. Attractive dark olive green foliage has bronze highlights and forms a compact clump, with flowers covering the entire habit later in the season. Replaces ‘Cherry Cheesecake' in the Proven Winners® lineup with larger flowers and improved flower form, more pronounced veining on the petals, darker foliage, and an improved, compact habit. (Rose Mallow) 8-8½in, vibrant pink flowers with salmon tones have an airbrushed central white halo and a small dark red eye. Overlapping petals create a three dimensional look to the flowers. Rich, dark green foliage forms a compact habit. Lots of flower buds translates to a long season of bloom. (Crapemyrtle) Dark olive green leaves cover its relative short, round habit. The tips of the leaves are edged with rosy red. In late summer cool salmon pink flowers burst forth from rosy red buds on dark rosy red stems. (Shasta Daisy) Lemon yellow buds open to cream flowers on a tight, compact habit. Large, 3-4in flowers have two rows of wide, overlapping petals. Flowers completely cover the dome-shaped habit of dark green foliage. Deadheading encourages rebloom. Does not require vernalization. (Catmint) If 'Purrsian Blue' wasn't small enough for you, you'll love ‘Kitten Around'! Even more compact and petite than its predecessor, this plant forms a tight, round mound of aromatic foliage. Bright rosy purple calyxes hold periwinkle blue flowers. (Beardtongue) A sturdy clump of deep burgundy purple leaves. Rich lavender purple flowers have pure white interiors and are produced on dark stems just above the foliage. This superior selection boasts a fuller, more refined habit, more vibrant flower color, and a more consistent flowering performance. 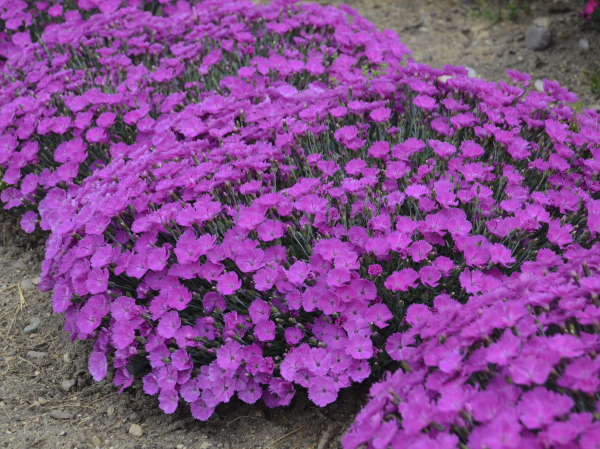 (Tall Cushion Phlox) A brand new Phlox that combines the color of Tall Garden Phlox and dome-like habits of Cushion Phlox. Dark purple buds open to lavender purple flowers with bright pink eyes, covering a broad, mounding, billowy habit nearly all the way to the ground. Excellent disease resistance; broad, glossy, dark green leaves stay clean all summer long. (Perennial Salvia) A refined, compact clump of deep violet blue and white bicolor flowers with attractive dark green foliage. Flowers are evenly and closely spaced on the stem for a full, polished look. Pratensis type. (Perennial Salvia) Dark fuchsia pink flowers in dark wine purple calyxes on a petite habit of attractive deep green foliage. This small sized package is perfect for the front of the border or grown in a quart pot. (Perennial Salvia) Prolific bloomer, producing loads of violet blue flowers on a petite habit of healthy, deep green foliage. This small sized package is perfect for the front of the border or grown in a quart pot. (Perennial Salvia) Light sky blue flowers on a low, rounded habit of healthy, deep green foliage. This small sized package is perfect for the front of the border or grown in a quart pot. (Perennial Salvia) The word Fashionista is often used to describe someone who is on the cutting edge of beauty, representing current fashion trends. Likewise, this collection represents the cutting edge of perennial fashion, with big, bold blooms in an array of chic and stylish colors. All of these varieties are Salvia pratensis hybrids with excellent garden performance. Soft pink flowers are held by dark mauve pink calyxes. (Perennial Salvia) Striking violet blue flowers are produced in a round, dense clump. (Perennial Salvia) Vibrant lavender pink flowers are held on darker pink calyxes. (Stonecrop) Groundcover type Sedum. Incredibly dark green, glossy foliage, on a compact, very tidy habit. Tiny clusters of yellow flowers. This perennial is tough and drought tolerant once established, so it's perfect for areas with hot, dry summers. (Stonecrop) Blue-green foliage on grey-purple stems with a dense, full habit, an improvement in form from the classic Sedum cauticola. Creamy grey buds burst open to cheery, salmon pink flowers. Dark pink seed pods. (Stonecrop) Dark turquoise succulent leaves have a smoky gray overlay. Rosy pink flowers with hot pink carpels explode over the dome-like habit late in the season. Dark purple seed heads extend the color long have it has finished blooming. An intermediate groundcover type. (Spike Speedwell) Paintbrush-like, long spikes of rosy purple flowers. This is one of the first speedwell to flower, starting about two weeks earlier than 'Very Van Gogh'. Its flowers cover most of the terrific, rounded habit.